Skygo - Where is the live cricket? Forums › Sky, Neon › Skygo - Where is the live cricket? What provider provides better coverage of live F1, including all free practice and qualifying - ALL in HD? And are you able to record it and burn to DVD? Skygo is a freaking joke! Tried watching the cricket on it yesterday couldn't even go more than 2 minutes without it lagging badly or the picture freezing forcing me to refresh and having to wait for the stream to reload. Then it would keep logging me out because appertaley I had too many devices logged into skygo (was only using it on my laptop). I got so fed up I looked for a stream online and what do you know it played perfectly no lagging nothing and I'm pretty sure the video quality was better which I guess isn't saying much considering skygos video quality is pathetic. How the official provider gets upstaged by a dodgy stream is beyond me! Really becoming disillusioned with sky only thing that's keeping me hanging on is the league and cricket. I've been very hit and miss with live F1 streams, watchable for practice\qualy but I've not found anything reliable enough for a live race. If I miss a race I look for the BBC torrents, they have far better coverage\ behind the scenes interviews etc. mr_shady: Skygo is a freaking joke! Tried watching the cricket on it yesterday couldn't even go more than 2 minutes without it lagging badly or the picture freezing forcing me to refresh and having to wait for the stream to reload. Then it would keep logging me out because appertaley I had too many devices logged into skygo (was only using it on my laptop). I got so fed up I looked for a stream online and what do you know it played perfectly no lagging nothing and I'm pretty sure the video quality was better which I guess isn't saying much considering skygos video quality is pathetic. How the official provider gets upstaged by a dodgy stream is beyond me! Really becoming disillusioned with sky only thing that's keeping me hanging on is the league and cricket. I just tried streaming SkyGo for the last part of the NZ T20 tonight. Lots of buffering\ terrible stream quality, lucky I only had 4 overs to watch. Going by the netmeter I use the transfer rate of the stream was barely breaking 100KB/sec, so it really had no excuse for buffering (on 65mbit VDSL here). I was very similar. Had to continually re-open browser due to the picture freezing (audio would continue to work) and the buffering was frustrating. I'm not on VDSL but 16Mbit ADSL2, still should work fine on that connection though. I must be the minority - streamed the cricket from first ball to the end with only one hiccup in the middle where it said a 'stream concurrency error occurred'. Had to reload the stream after that, but got a very decent quality stream in my opinion with no lagging, buffering or lowering of resolution. I was using an iPad 4 Retina on an ADSL2 connection. I too had the picture freezing but audio still going issues. Not sure if it was coincidence or not but I disabled hardware acceleration in the flash settings and the issues disappeared and I watched the second half of the match without any issues at all. I was using OS X 10.9.1 with Chrome. Just checked with a friend and hes used an ipad at work with good results also. It looks like using the app is a significantly different experience to using the website. I just tried on 5S it's good . iPad is charging so can't test right now but that's always been sweet. 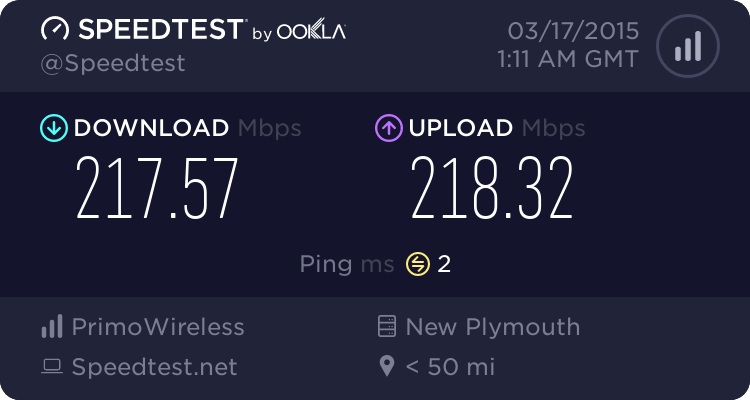 Can u advise speedtest.net as to how that compares with your BB connection? What ISP are you with? The friend that has been watching it on the ipad fine (at work) tried to demo it at his house the other night. The stream wouldn't even load on the ipad and he's on Telecom. I just tested the stream now through a web browser and its buffered twice in less than a minute. Quality is the same as last time too, aka poor, there is no way I could watch it at fullscreen. I'm with Telecom too, so perhaps its an ISP level issue? Can anyone with a Mac tell me if SkyGo is working for them? I can sign in, hit play, but get absolutely nothing on either Chrome or Safari. I would switch to my PC to watch this avo's cricket but of course that would be a change of device I couldn't undo for another 30 days... stoopid. Edit: had DNS configured to getflix.com.au for Netflix access, obviously the two don't play nicely. Thanks to another thread on this forum for pointing me in the right direction. I have constant buffering and freezing issues with Sky Go on any live sport (using iMac and latest OSX version). I use it occasionally to watch the A-League and have found it to be completely hopeless. Catch-up seems to work OK - it's just the live coverage that it really struggles with.